By the 70s, Hammer didn’t have a whole lot left to give. Only a handful of films after 1970 lived up to the high standards Hammer set in its early years. Most of the ones that are remembered are only recalled because they are sequels to other successful Hammer movies, while the rest are relegated to cinematic obscurity. But there are some films from this age that were proof that Hammer still had some sense left. Twins of Evil, though a far cry from a Hammer masterpiece, manages to be one of the gems from this time. Peter Cushing plays a fanatically religious zealot who habitually charges teenage girls with witchcraft and burns them at the stake. When his twin nieces suffer the loss of their parents, he becomes their guardian. One of the twins is good and humbly follows her uncle’s rules. The other twin is rebellious and ends up turning into a vampire. Much double-identity bedlam between good twin/evil twin ensues. First of all, this is the type of role Peter Cushing fans love to see him play. While he can play a one-dimensional evil lord or a fanatical hero better than anyone, this character made him stretch beyond his boundaries, as his character was always at odds with himself. Not to mention, it is one of the few characters he plays who actually grows throughout the course of the film. In the beginning of the film, he is a spiteful religious zealot who has clear though misconceived definitions of right and wrong and would not have any qualms about burning an innocent woman at the stake if he saw fit. However, when his niece becomes a vampire, the line between what his mind believes is right (she needs to be burned) versus what his heart believes to be right (no barbeque today), becomes clouded. The scene when he finally makes his decision on her fate is purely heart-wrenching. 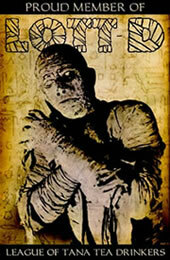 He was sheer electricity on the screen, and I can give you no better reason to watch this film than his performance. And it’s a damn good thing Cushing was in this film, because it certainly wasn’t going to make it on the writing alone. While the plot was fun and the movie was interesting to watch, there are quite a few lapses of logic that can only be overcome if you have a really warped suspension of disbelief. For example, the evil twin apparently becomes a vampire after she receives the vampire’s bite (instead of dying) because “her heart is true to Satan,” which I simply did not buy. Prior to this, she was certainly the bad seed of the two girls, but not all that more rebellious than a normal teenager. Satanic, she was not. Establishing her prior to this scene as truly evil and not just rebellious would have made her transformation more believable. Also there is a mistaken identity scene where the good twin gets gravely mistaken for the evil twin. But even though the good twin is surely aware this is happening, she doesn’t actually say that she is NOT the bad twin until it’s discovered by mistake, and almost too late. This didn’t seem believable either and was clearly done just to push along the story. One could say that perhaps she was trying to save the evil twin from her fate, but I don’t buy that either because there was not a strong enough relationship between the two sisters established to make this actually believable. There was random stuff to feebly create a “bonding”, such as the one twin feeling the other twin’s pain… but nothing on an emotional level. And I just can’t accept the fact that the reason she does this is because she is the “oh so good twin, who will sacrifice herself for anyone because that’s the right thing to do” either. Last time I checked, I wasn’t watching a fairy tale. But on a completely superficial level, this was such a fun film that even the above points do not really hamper the viewing experience. And the twins -- and they used real twins, not simply a screen-splitting job -- were magnificent as well. They had a great look to them since even though they were identical, you could completely believe one could be demure and innocent (played by Mary Collinson) yet the other could be hideous and vicious (played by Madeline Collinson). Madeline was clearly the one who had the most acting props (or maybe I just prefer evil undead people, who knows). It’s a shame she didn’t go further with Hammer than she did. I usually tell my readers to avoid the 70s Hammer films like the plague as they are only setting themselves up for painful viewing experiences. But Twins of Evil is proof that there are some gems amongst the large piles of crap. 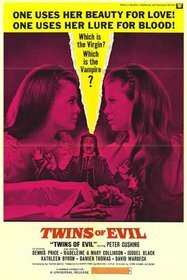 Flawed, but fun, Twins of Evil is one of the better films Hammer had to offer us from this time period. Providing you don’t go into it with the high expectations you came to expect from the earlier Hammer age, you will find it to be quite the enjoyably ghoulish ride. Submitted by damien (not verified) on Wed, 2010-12-22 15:36.